The American media mogul, Robert Edward ‘Ted’ Turner III is the founder of the cable news network CNN. He is one of the most powerful, charismatic and ambitious visionary who transformed the television industry with his ideas. 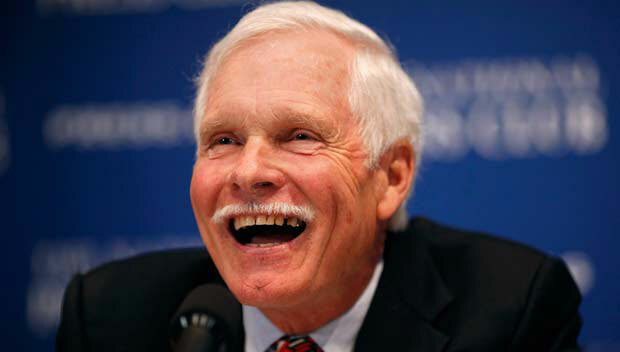 Ted Turner was born on 19th November 1938 in Cincinnati, Ohio to the billboard magnate Robert Edward Turner II. Turner went to Brown University but unfortunately could not complete his diploma in economics as he was expelled for bringing a female student to the dorm. He was however given an honorary degree from Brown in 1989. Upon his return from university in 1960 he joined his father’s company getting the post of general manager. After the death of his father, he assumed the role of president and CEO of the Turner Advertising Company. His business prospered during the late 1960’s so much so that with the profit earned, Turner managed to purchase the Southern radio stations. In 1969, he sold many of the stations and bought a television station in Atlanta. Turner had the premonition that people wanted more choice in their channels so he would buy struggling stations and turn them into the most watched and appreciated channels by airing movies, cartoons and the latest sports games. In 1976, Turner got permission to use satellite for transmitting content to the local cable television providers nationwide. With the development of cable stations, many of them began carrying his station to free their schedules, which highly increased his viewership and marketing. With his subscribers reaching almost 2 million, Turner’s net worth peaked to 100 million dollars. In 1978 Tuner made a deal with an MIT university radio station named Television Broadcasting System and got the rights to the WTBS call sign. He started using TBS as the acronym for this station which stood for Turner Broadcasting System. In the late 1980s Turner established the Goodwill Games which were broadcasted on his superstation which again immensely raised his viewers and profits. Tuner founded CNN, a 24-hour only news channel, in 1980. He stated ‘We won’t be signing off until the world ends. We’ll be on, and we will cover the end of the world, live, and that will be our last event… we’ll play ‘Nearer, My God, to Thee’ before we sign off’. CNN which is Tuner’s most ambitious venture was at first dismissed by broadcasting professionals as being ‘hopeless and impractical’. Despite the poor forecast of the channel, CNN grew fast and in a few years’ time expanded to include CNN Radio and CNN International. Turner was now a billionaire. He bought the MGM Entertainment Company however sold it back to its original owner immediately. Again what was seen as a poor move by many earned Turner 125 million dollars from his film library. Meanwhile CNN was becoming talk of the world with its vast broadcasting and coverage of events like the Chinese army suppression of democracy movement and Iraq war. In 1992 Tuner purchased the animation studio Hanna-Barbara and soon launched Cartoon Network the most renowned cartoon channel. In 1994 he started a new 24-hour channel ‘TCM’ (Turner Classic Movies) that showed movies uncut and uninterrupted by commercials. By this time Turner owned the largest number of land property in the U.S. Currently, Turner concentrates and works for the culmination of weapons of mass destruction and environment degradation.